Could the diplomatic rescue mission by Bill Clinton in North Korea be a model for winning the freedom of three American hikers arrested last week when they wandered (apparently by mistake) from Iraqi Kurdistan into Iranian territory? The emotional reunion of journalists Euna Lee and Laura Ling with their families in America must have given hope to the relatives of the three hikers, Shane Bauer, Sarah Shourd and Joshua Fattal. If a way was found to solve an impasse between the U.S. and bellicose North Korea, cannot one be devised for the hikers? The trouble is that the situation the hikers literally walked into involves not just two parties but perhaps three and a half, with several gradations of belligerence. First there are the U.S. and Iran, which officially do not talk to each other. Then there is Iraq, which talks to both but doesn't want to disturb either. Finally, there are the Iraqi Kurds, who run their provinces autonomously and have textured relations with both the central government in Baghdad and the Islamic Republic of Iran, which has a substantial Kurdish minority itself. The hikers, who were arrested on Friday, July 31, and charged by Iran with illegal entry, were taken just as U.S.-Iran relations are growing more nuanced. After the hard-line Bush years, the Obama Administration has tried to take a relatively neutral stance in regard to the turmoil following July's disputed election. The U.S. has also been treading carefully on the sensitive issue of relations between Iran and the Kurds. Earlier this year, the U.S. froze the assets of a Kurdish separatist group accused of planning attacks in Iran from the mountains of Iraqi Kurdistan. The U.S. has, moreover, not done anything to come between the Iraqi government and its decision to retake Camp Ashraf, occupied for years by an Iranian exile group violently inimical to Tehran. "It's a sovereign matter for the Iraqi government," said a U.S. official of the action. Washington has designated the group, the Mujahedin e-Khalq, a terrorist organization. The current power struggle in Iran has made a quick resolution of the hiker situation unlikely. Until some sort of political stasis is achieved, it will be hard for outsiders to know whom to appeal to for their release. And the potential power brokers in Tehran aren't likely to want to be distracted either. From the Iraqi perspective, meanwhile, the hiker "crisis" is barely one at all. "Bush would have made it a huge problem," says Muhammad al-Khatib, an independent parliamentarian allied to the political parties closest to Iran, "but it occurred at [the] time of Obama, who is trying to improve the relations with Iran." Khatib predicts the crisis will be solved diplomatically. But it won't be simple. "The reality of politics in Iraq," says Khatib, is that "Iraq will need Iran and America to rebuild the country." It therefore does not pay to disturb the delicate status quo by making loud noises about three hikers. 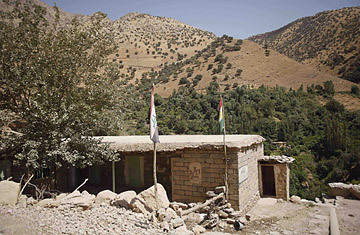 Iraqi Prime Minister Nouri al-Maliki must also carefully manage his sometimes rocky relations with the Kurds. In trying to consolidate power in the long walk-up to national elections in January, he is not only depending on a broad coalition of his fellow Shi'ites but has also reached out to leaders of disenfranchised Sunni populations. But then there are the Kurds, who control what is the most peaceable and prosperous areas of the country. Kurds represent a large bloc in parliament and hold key positions in al-Maliki's government; Jalal Talabani, who is Iraq's President, is a Kurd. Maliki's relationship with the non-Arab ethnic group has been a political roller coaster. The past few years have seen recurring disputes over petroleum revenue-sharing, the authority to sign oil contracts and what control the central government has over Kurdish security forces. And there's still a large swath of "disputed territories" that lies just outside official Kurdistan Regional Government (KRG) territory but that Kurds claim as rightfully theirs. Recently, al-Maliki attempted to assert control, and only U.S. troops prevented shots from being fired in a 24-hour standoff. As for Iraq's Kurds  in whose territory the hikers were traveling before they crossed into Iran  they have reacted cautiously to the crisis, seeming to know that it will not pay to rile the Iranians even as they try to placate the Americans, who have been among their biggest supporters. "We've offered our assistance [to the U.S. on the hiker dispute]," says the top KRG official, speaking carefully. "We inquired with the Iranian consulate in Arbil [the KRG capital] regarding the three Americans who knowingly or unknowingly but in either instance illegally crossed into Tehran." Watch TIME's video "Iranian Rockers Unite for Freedom."